In addition to these capabilities Boost Manager Plus+ tracks real time results and saves them to a .csv file that allows users to track the effects of changes using the provided log viewer for adjustment purposes; a feature not available on other systems. Boost Manager Plus+ includes built in circuits that guard against detonation caused by electrical malfunctions or component defects in the water/methanol injection system by monitoring methanol pump current flow. If excess current draw is detected (short circuit or blocked line) or if current draw drops below a set point (open circuit, lack of fluid in the tank, or faulty pump) the Microprocessor will reduce boost to lowest setting to protect your engine a feature not available on any other controller. Boost Manager Plus+ also includes two general purpose outputs (GPO’s) that can be used to duty cycle an optional fluid control solenoid. This feature can be used to cut off fluid flow and prevent possible siphoning (pump mounted below tank fluid level). Fluid solenoid can also be used to restrict flow momentarily and allow the system pump to build line pressure and ensure correct atomization of water/methanol solution. The Boost Manager Plus+ electronic boost controller is designed to maintains desired boost levels by duty cycling an electronic boost control solenoid (not Included) that applies boost pressure to the waste-gate diaphragm. Boost and boost target are monitored and controlled using a microprocessor controlled feedback loop (PID*) to maintain the desired manifold pressure using one of the following control options. Option 1: Simple or fixed value method. In this mode a fixed maximum value is programmed into the Boost Manager Plus+ controller using the supplied user interface (adjustable base map are provided with the unit). The Boost Manager Plus+ controller will monitor (using included 6BAR MAP Sensor) the resulting boost level and automatically apply corrections to maintain the target boost levels. Result can be logged and viewed using supplied user interface and played back using the log viewer function. Option 2: Driver adjustable or variable method. In this mode the driver uses a rheostat to vary maximum boost between high and low values set using the included software. This set-up permits on the fly adjustment between two set values; minimum boost level (established by the waste gate spring setting) and the highest possible value programmed into the controller (limited by system hardware). In both options , Boost Manager Plus+ will default to the low target if it detects a fault in either the fuel pump circuit or the methanol supply system circuit to protect against possible engine damage. 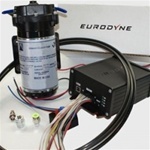 Introducing Eurodyne’s Boost Manager Plus+ Eurodyne Canada, a recognized leader in performance tuning and innovation is proud to introduce the Boost Manager Plus controller; the first controller to combine 3 important & interrelated functions in a single programmable microprocessor controlled unit. The easy to use computer interface software allows the Boost Manager Plus+ user to: Manage boost pressure Set optimum quantity control for water methanol injection Duty cycle high volume/high current return-less fuel supply pumps to maintain precise fuel pressure regulation In addition to these capabilities Boost Manager Plus+ tracks real time results and saves them to a .csv file that allows users to track the effects of changes using the provided log viewer for adjustment purposes; a feature not available on other systems. Boost Manager Plus engine safeguards Boost Manager Plus+ includes built in circuits that guard against detonation caused by electrical malfunctions or component defects in the water/methanol injection system by monitoring methanol pump current flow. If excess current draw is detected (short circuit or blocked line) or if current draw drops below a set point (open circuit, lack of fluid in the tank, or faulty pump) the Microprocessor will reduce boost to lowest setting to protect your engine a feature not available on any other controller. Boost Manager Plus+ also includes two general purpose outputs (GPO’s) that can be used to duty cycle an optional fluid control solenoid. This feature can be used to cut off fluid flow and prevent possible siphoning (pump mounted below tank fluid level). Fluid solenoid can also be used to restrict flow momentarily and allow the system pump to build line pressure and ensure correct atomization of water/methanol solution. Boost control function The Boost Manager Plus+ electronic boost controller is designed to maintains desired boost levels by duty cycling an electronic boost control solenoid (not Included) that applies boost pressure to the waste-gate diaphragm. Boost and boost target are monitored and controlled using a microprocessor controlled feedback loop (PID*) to maintain the desired manifold pressure using one of the following control options. (*PID (http://en.wikipedia.org/wiki/PID_controller) Option 1: Simple or fixed value method. In this mode a fixed maximum value is programmed into the Boost Manager Plus+ controller using the supplied user interface (adjustable base map are provided with the unit). The Boost Manager Plus+ controller will monitor (using included 6BAR MAP Sensor) the resulting boost level and automatically apply corrections to maintain the target boost levels. Result can be logged and viewed using supplied user interface and played back using the log viewer function. Option 2: Driver adjustable or variable method. In this mode the driver uses a rheostat to vary maximum boost between high and low values set using the included software. This set-up permits on the fly adjustment between two set values; minimum boost level (established by the waste gate spring setting) and the highest possible value programmed into the controller (limited by system hardware). In both options , Boost Manager Plus+ will default to the low target if it detects a fault in either the fuel pump circuit or the methanol supply system circuit to protect against possible engine damage. Water/methanol injection control function While several variations of water methanol injection are available, most base injection volumes on a single variable – boost pressure with no consideration given to air volume. This results in the same water methanol injection amount for a given manifold pressure at all engine speeds – a less than ideal situation. In order to establish accurate and predictable injection amounts knowledge of air volume is needed. The Boost Manager Plus+ controller is the only controller that accurately establishes air volume by performing a calculation based on manifold pressure and engine speed. Boost Manager Plus+ water methanol injection amounts are infinitely variable and controlled digitally using a fully adjustable 16 x 16 – 256 point map. Injection value selection is based on inputs from the included 6 BAR (0 to 86 PSIG) pressure sensor and an RPM signal from an ignition coil or a fuel injector. The Boost Manager Plus+microprocessor then selects the correct water methanol pump duty from the values previously programmed to memory using the provided base maps included in the software package. Results of water meth duty cycle map can then be viewed using the included data logging feature. Users can then edit and customized water methanol calibrations suited to their specific hardware combination. Fuel pump control Most modern direct injection fuel system vehicles come equipped with a returnless type fuel system managed by the engine controller. When returnless fuel delivery systems are used the engine controller manages fuel pressure by varying the current flow (duty cycling) the delivery pump. This design can present challenges when increased fuel supply is required to support higher power levels as the internal circuitry of OEM controllers is not capable of delivering the increased current levels required by high performance high volume pumps. If a larger fuel pump with greater current requirements is installed in an otherwise stock vehicle, the supply wiring and pump driver circuitry on OEM systems is generally unable to properly supply the larger capacity fuel pump with proper voltage and current resulting in poor performance. Boost Manager Plus+ provides a solution to this challenge using one of the two available fuel pump driver modes. Mode 1: Pass through; during the installation, the stock pump and supply wiring is connected to the controller. Data on duty cycle is provided by the vehicle’s ECU. In this setup ECU is relieved of the current supply role, the Boost Manager Plus controller’s more robust drivers do the work of supplying fuel pump with required current. In most cases the heavier duty Boost Manager Plus+ circuitry (40 amp driver) using a direct battery feed will allow improved performance and delivery and meet higher fuel demands while retaining the stock fuel pump and loop pressure control. Mode 2: Override; in override mode, fuel delivery is managed solely by the Boost Manager Plus+ pump control circuit and based on a set value stored in the fuel pump duty cycle MAP. Pump duty is selected from 256 point fuel map and based on intake pressure and RPM information obtained from the supplied MAP sensor and coil or fuel injector (RPM) information. Resulting duty cycle can then be logged for evaluation and fine tuning. This mode is ideal for high demand systems requiring high volume fuel delivery. Data logging and MAP editing features Find out how your system is performing and make the changes needed to get peak performance. The Boost Manager Plus+ data logging feature included with every unit allows tracking of all performance critical variables including: Boost pressure up to 6 BAR Boost target VS. actual Boost control duty cycle Engine RPM Methanol pump duty cycle Methanol pump current flow Fuel pump duty cycle Fuel pump current flow Duty cycle of general purpose output The Boost Manager Plus+ software saves this data as a .csv file for playback using the included log viewer; information can also be viewed as a data file using Microsoft Excel©. If the data log indicates a requirement for change, the provided base maps can be modified by selecting individual cells or groups of cells, entering new values and then saving the new data under a new file name. Modifications can be made until the desired result is achieved. 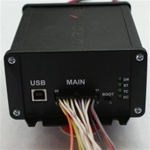 The Powertap® interface is an intelligent high speed interface device that contains a 16bit micro controller with dedicated hardware for both CAN bus and K-line protocols. The Powertap interface supports high speed communication not available when using generic interface cables and allows communications with your engine controller giving you access to the many features and capabilities in included in the Maestro Tuning Suite. Eurodyne Editor is a a complete high speed data logging package that provides graphing and map tracing features and the Maestro map editor. This powerful software package allows access to all relevant maps, scalars and switches inside the ECU binary. Editing wizards are included to speed the implementation of map adjustments. Once edititing is complete file can be saved under a new name the uploaded to your engine controller.